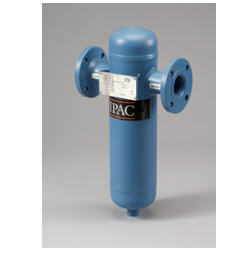 IPAC’s Flanged Centrifugal Moisture/Water Separators are designed to remove more than 99% of the moisture condensed by an air cooled or water cooled after-cooler in a compressed air system. As moisture-laden air from an after-cooler enters the separator, it is forced to pass through directional impellers which spin the air around the separator’s body. Droplets of water are then impinged on the separator wall by centrifugal force. Maximum velocity is reached near the bottom of the lower chamber where the vortex is strongest. The water droplets then coagulate and drain from the separator, while the dry compressed air travels up through the center of the vortex at a reduced velocity to exit the separator. Download PDF.